The BUEI features the remarkable Jack Lightbourn Shell Collection, one of the finest exhibits in existence today. The Teddy Tucker Shipwreck Gallery and The Treasure Room transports you to the mysterious undersea world of shipwrecks, artefacts and valuable relics of historical importance. Explore deep, clear underground pools of azure blue water and incredible formations of every size and shape imaginable. Cave ceilings are adorned with rare chandelier clusters and delicate crystallized soda straws. Each cave is uniquely beautiful and is a new adventure to discover. Be sure to explore them both. Spend the day having fun swimming with dolphins in their ocean water safe haven. Create a magical multi-sensory connection when you touch a dolphin that will touch your heart. Visit the Dolphin Deck Gift Shop onsite for the coolest dolphin shirts, hats, toys, books and souvenirs. Within the walls of this nineteenth century fortress where troops once marched, there are now lawns, flower lined lanes, fine dining and a quaint Clocktower shopping mall. Situated on an acre of oceanfront property, Bermuda Fun Golf features 18 challenging holes designed after famous holes in USA, Scotland and Bermuda. Dockyard’s Snorkel Park Beach is the most fun on the beach in Bermuda! All the exciting water sports and activities you want, in one fantastic beach front location! Bermuda offers a wide variety of activities for the entire family. Whether it be relaxing on the beach, or practicing your golf swing there are plenty of opportunities to indulge yourself within Bermuda. 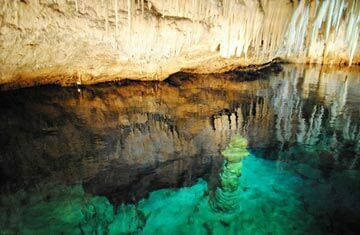 Explore the pure, natural environments that Bermuda has to offer with Hidden Gems. Swim with Bermuda’s beautiful dolphins at Dolphin Quest in Royal Naval Dockyard. Tour the Atlantic Ocean on a kayak or choose to rent a pedal bike for the day and explore the ‘Old Bermuda Rail Trail’. You are guaranteed to fall in love with Bermuda’s natural beauty. There are not many places on the island that provide as many amenities as Snorkel Park Beach. During the day you and the family can lounge on the beach or dive into our beautiful crystal clear, shallow waters while also enjoying numerous watersports activities. Grab some local delights from Hammerheads Bar & Grill and enjoy the ocean-view from the upstairs balcony. But don’t leave yet! After the bright vibrant sunset, party under the stars to live entertainment and local DJ’s for the total beach paradise package. If you feel like catching a new release while visiting Bermuda head on over to Speciality Cinema & Grill, your alternative to the megaplex movie going experience. 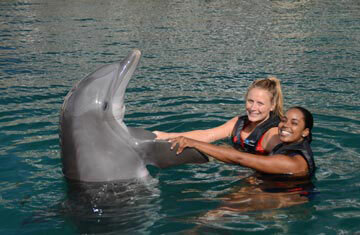 Swimming with dolphins is a fun activity for the whole family, be sure to add Dolphin Quest to your activities list. Hartley’s Helmet Diving is a premier undersea walk that is a delight for all ages. 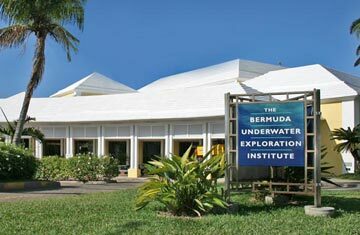 See the island from 10ft below sea level as you explore the sea life and pristine waters at Bermuda’s barrier reef. No scuba diving lessons or snorkeling skills are required and there is no exertion of physical activity, which is perfect for the entire family. where you can release the artist within is at Studio 8 Glass, cut create and learn!. Experience the wonders of the Ocean without getting wet at ocean Discovery Centre at BUEI. Dockyard through our daily events, by daylight or moonlight, there is so much to discover. Inhale the fresh air and take in the fields of green grass, and oceans matching the bright blue colour of the sky. 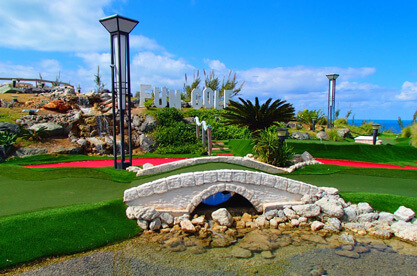 If you are looking for a fun and competitive 18-hole game of golf visit Bermuda Fun Golf for a quick game of mini golf accompanied by drinks at the Caddy Shack Bar. Bermuda Bridge Club runs an open, stratified duplicate game of Bridge on Monday afternoon and evening, Wednesday morning and Friday evening. If you thought the beach was relaxing you are in for a treat at Willow Stream Spa at Fairmont Southampton. Open 365 days of the year; here you will experience pampering treatments that combine natural elements with local Bermudian traditions. At La Serena Spa, this peaceful and tranquil location offers views of the Atlantic Ocean and treatments customized to for men and women. The Spa at Elbow Beach is an intimate, oceanfront retreat, located at our Paget Parish Hotel, designed to infuse romance and peacefullness. There are a number of ways to tour Bermuda. If your a thrill seeker try K.S. WaterSports Bermuda Adventures & Tours. Whether you choose to snorkel, parasail, ride the Wildcat or jet ski you will have a fantastic experince on the water. 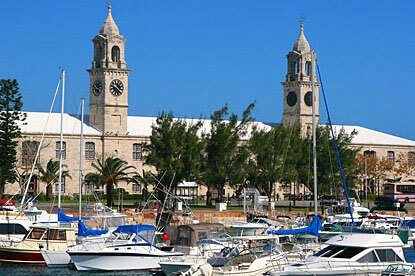 Another option for exploring Bermuda by land is the Bermuda Train Company. Both iconic and unforgettable enjoy unique narrative trolley tours of the island in a clean, comfortable setting. From jet ski safaris and boat rentals to paddleboards & kayaks, bicycling and bespoke adventure tours, your options are endless for having an epic time out on the water in St. George’s. A group of tiny islands in a turquoise sea is calling you… to an interlude of enchantment, an adventure with beauty… to a semi-tropical paradise where you’ll bronze in the sunlight and glory in the moonlight.